For once, Ivan Bel slides over to the other side of the microphone and answers questions from his long-time friend: Pierre-Emmanuel Canon. An Asia-roaming backpacker for 25 years, Chinese speaking, serious reader and passionate about Shiatsu, Ivan Bel is also a chronic dissatisfied: not far enough, not deep enough, he constantly pursues various quests that go through Shiatsu therapy in all its forms, energy, meditation and martial arts. Portrait of a permanent explorer. Pierre-Emmanuel Canon: Dear Ivan, I know you have many tricks up your sleeve, but the first question that I want to ask you is: what led you to art of body work? Ivan Bel: My encounter with Shiatsu dates back to the years when I lived in Paris. At the time, I was an IT manager in a very innovative start-up. We worked like crazy 8 to 12h a day on company tools, customers, computer servers and the Internet. We used to provide training for videoconferencing back in 1995; I might as well say we looked like aliens since no video chat existed back then. One day, I realized that I only communicated in programming code with my assistants. That triggered my decision to leave this job and go clear my mind in Asia. When I came back, I had various jobs and I started studying Shiatsu in parallel. I had discovered this practice during intensive Aïkido summer camps. It had immediately clicked with François Dufour’s technique, the teacher who initiated us during that camp. That made me want to organise a course in Paris with other students from the Aïkido dojo. I had heard of a young teacher whose name was Françoise Bataillon [i]. We agreed she would come more or less every week to give class to some ten people. But the experience stopped after a year for lack of practitioners. I could not find what I had liked about the camp and the other students did not want to follow through either. So I stayed alone with my desire to learn more. That did not stop there, I suppose? No, and the next development followed an improbable set of circumstances. At the time, I used to swim regularly. And since I had caught a wart at the swimming pool, I had to make an appointment with a dermatologist. Chatting with her, she mentioned the fact that she had just rented out an apartment to a Shiatsu practitioner, just around the corner from my place. So I immediately made an appointment with her. She was a Dutch woman named Lucy de Mooy who had just completed her training at a school in British Columbia. These schools in Canada are among the best schools in the world to learn Shiatsu. Their curriculum is very dense, from 2000 to 3000 hours of classes over 3 years. In addition, the practical parts of these courses are done in a University Clinic, so that at the end of the studies, those students have a large practical baggage and know what to do with their hands. By the way, I would very much like this to be the curriculum used in Europe. But anyway! From the first contact with this woman, I was impressed by her work. So I immediately asked her if she would take me as a pupil. Unfortunately, teaching was not part of her immediate projects. I kept insisting every time I went to see her and finally she gave in at our sixth meeting (laughter). I know: I am stubborn. So she accepted me to pass on her knowledge in private lessons. I had to work on her and she didn’t really appreciate being touched by inexperienced hands. What I discovered was that she had a really good level in karate and wouldn’t hesitate to correct me severely, kicking wildly, were I to wander off track (laughs). Since she did not have a course program, she started by making me repeat the Namikoshi kata for a full year. It got tedious after a while, but at least I knew it by heart. The two and a half years that followed, the work focused on the meridians. It is thanks to this somewhat improvised approach that I was able to start on a very solid basis. Incidentally, when I said that I had repeated this kata for a year to Masters of Japan Shiatsu College in Tokyo, it gave them a good laugh. Even there, they do not insist that much. But though my bases were solid in terms of technique, pressure and posture, I was a little light as far as energetics skills go. And I am in fact still unsatisfied with my level in this area. 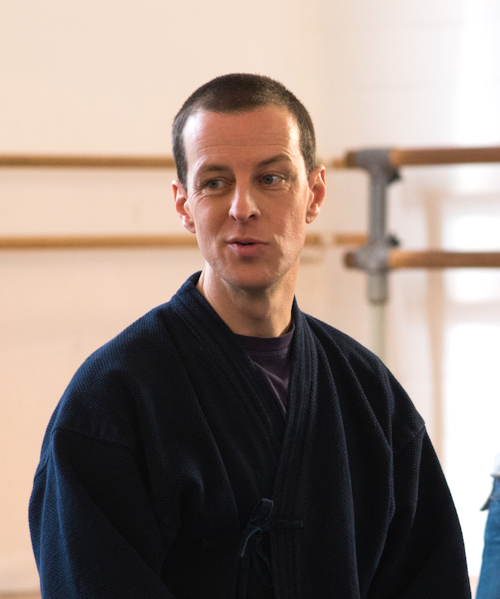 Life made me settle in Brussels where, thanks to the introduction of Jean-Marc Dessapt [ii] – a long time friend who was finishing his Shiatsu curriculum – I was able to follow Yuichi Kawada’s [iii] teachings. I followed his entire curriculum until graduation plus an extra year. Add it all up and it’s been nearly eight years as a student, which actually is nothing extraordinary as I know many people who chose to “repeat” their studies. I also followed many seminars, most notably with Shigeru Onoda [iv] and Wataru Ohashi [v]. I also trained in Chinese medicine with Jean-Marc Weill [VI], who is a fount of knowledge in this field, and Raphaël Piotto [VII] who made me look at the philosophical/esoteric side of Chinese medicine. These two teachers greatly helped me develop a sharp and therapeutic vision of Shiatsu, which later enabled me to integrate the UFPST (French Union of Professional Therapeutic Shiatsu practitioners) and to inch closer to another absolutely fantastic grandmaster, Bernard Bouheret [VIII]. With the help of all these people, I lack neither inspiration nor material to work on. I feel like I am still a simple student, which is the case anyway. Especially when I compare myself to giants that still inspire me today — Frans Copers [IX] comes to mind, in particular. At the beginning of my arrival in Brussels, I occasionally gave a Shiatsu, but it was only two years later that I founded my business and started a real practice. How were the Biloba network and the EMS (European Massage School) born? Since I had had the good idea of reserving the “Shiatsu-Brussels” domain name for my website, my diary ended up being full in less than a year. I was thus able to direct the extra requests to David Gaudin, whom I had met at the intensive summer Shiatsu trainings. After a year, I had the idea of creating a larger network that would identify more therapists. That’s how I founded the Biloba network. About one year later David came to find me with the project to create a school. At the time I had been giving private lessons to someone for a little while (who had insisted on 6 occasions before I yielded in, see?…), but I did not yet think of a broader and more regular course. We discussed it and I decided to take care of the Shiatsu part, to set up structured courses based on my knowledge. It was a huge amount of work that took me 5 years of writing, reading and thinking, summer vacations included. Today I don’t work in the school anymore but the Shiatsu section goes on its own sweet way, which matches my dearest wish, as I really aspire to spreading Shiatsu to as many people as possible. In the meantime, I became a member of the board of the UFPST under the inspiring direction of Bernard Bouheret and Jean-Marc Weill; it is a great opportunity because I can rub shoulders with them more frequently. 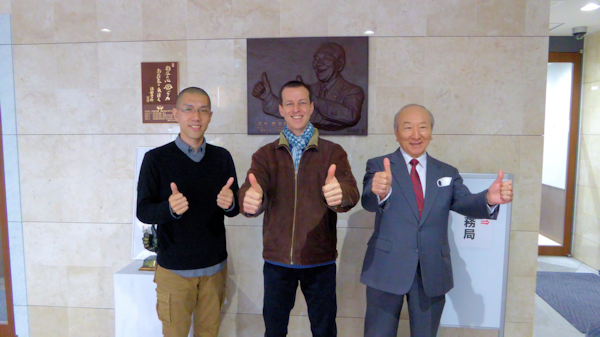 I also had the honor of being very welcome at the Central School of Shiatsu Namikoshi, the Japan Shiatsu College in Tokyo, by Namikoshi Sensei [x] as well as at the school and clinic of Irie Senseï [xi] (who teaches Koho Shiatsu, literally “Shiatsu Classic or old”). From left to right: Watanabe Sensei, Ivan Bel, Kobayashi Sensei, Tokyo, 2016. What does your work with Bernard Bouheret bring you? That’s something we could talk about for hours! Essentially it brings me joy, because his Shiatsu is synonymous with joy. When you receive it, you don’t just feel touched at your deepest, but it brings out the primary joy, that of life, which is buried in all of us. In addition, he applies a simple and profound spirituality that gives meaning to the practice of Shiatsu. I’ve just come back from India where I’ve traveled with him for 10 days. It was an intense experience in every sense of the term to share day-to-day life with him. Of all the Masters I have crossed on my journey, I can confess that he is the best teacher and practitioner I have met yet. Going to see him at an intensive training is the best way to understand what I’m talking about. With Bernard Bouheret, a class in India, Auroville, 2018. You certainly can say that you have not been wasting time, it is a rather well paced string of events! Could you tell us what path you chose in Shiatsu? I imagine that like in all traditional body approaches there are different possible directions. To be able to answer this question correctly, I must quickly outline the history of Shiatsu. There were originally quite a few different practices of digitopresure. But the first mention of the term Shiatsu was made in a work by Tenpeki Tamai dated, it is thought, 1914 [XII], titled “Shiatsu Ryoho” (literally, “therapeutic shiatsu”). Common belief situates the creation of Shiatsu by Tokujiro Namikoshi in 1950, but it is actually much older than that. Anyway, Namikoshi was self-taught and his approach was very pragmatic. He focussed mainly on the physical sphere and obtained good results at the physiological level too. And it still is the central aspect of this Shiatsu style. On the other hand, the energy aspect was not really developed in his practice. This subtler dimension has found itself an ambassador thanks to the passionate research of Shizuto Masunaga. The latter has indeed integrated the knowledge of Western psychology, Traditional Chinese medicine and especially the use of meridians, after having absorbed the mechanical approach of Shiatsu. This is how the two main styles were born. Since Masunaga was younger and drawn to discovering the world, his style quickly spread through his travels, especially in the West. Namikoshi’s style has remained rather constrained to Asia until quite recently. That is beginning to change, they are becoming more open to spreading around the world. The version of meridian based Shiatsu that we know in the West is therefore a legacy of Masunaga. Surprisingly, pressure-focused Shiatsu is now being rediscovered for its aim at muscular relaxation, whereas it was the first official form (and still is the main one) in Japan. Moreover, the only state title of “Shiatsu practitioner” in Japan is that of the Namikoshi school, which represents more than 80% of the country’s practitioners. Personally, I was influenced by both approaches. My bases were built on the Namikoshi style with my Dutch teacher. With the teaching of Kawada, I was introduced to the energy aspect since he had received the teachings of both masters at a time when he was a young student at Japan Shiatsu College. Later, I became interested in the currents of Shiatsu used in traditional martial schools. These styles are older, coarser and rougher too. They are clearly intended for martial arts practitioners with an already solid body and capable of enduring a lot. I like that aspect of shiatsu, because it echoes the 30 years of martial arts practices that shaped my body and mind in a certain way. It is found in a style I don’t know well, master Harada Shinsei’s shiatsu from the jigen ryijing jujutsu school, and even more in master Ryotan Okuyama’s Koho shiatsu from the Hakko ryû jujutsu school. The ohashiatsu style of master Ohashi is interesting, and I followed his seminars in France and Belgium. It is quite an experience seeing him make an oriental diagnosis: it is particularly impressive and he remains my reference as far as observation goes. I also love his ability to think out of the box: it has allowed him to invent other forms of shiatsu, including resorting to a headscarf (tenugui) or his work for pregnant women. Together with Jean-Marc Weill and Bernard Bouheret, I was able to develop the therapeutic approach of shiatsu. That’s what I always missed in my classes and was looking for by myself. Indeed, I did know how to work on the mechanical body and on the meridians, but establishing a good Eastern diagnosis according to the TCM and choosing among the points that really will answer the recipient’s request: that, to me, is the state of the art. It is no longer just about trusting an intuition that was based on, well, a hunch, but about being able to build a structured reasoning to determine the best possible treatment. Then and only then can you let go and return to your intuition. The difference is that this is based on solid knowledge. But thanks to this approach, there is less fumbling and approximation in the treatment. And as a general rule, I remain fond of all trainings proposed by masters in this area. My agenda is pretty full in this respect. At the end of the day, what does that translate into in your fingers? At some point, with a lot of practice, these different approaches necessarily come to merge. I summarized everything I could pick up on my journey into “Ryoho Shiatsu” in tribute to the unrecognized founder, Tenpeki Tamai. I try to make our students understand that a mechanical-based problem will primarily be solved using mechanical techniques. If someone comes in for a lumbago, good luck solving their problem solely with energy. Granted, it will relieve them but it may take a long time. In my experience, the best practice is to start with the mechanical approach. Knead the body, unknot it, stretch it, mobilize the joints and when the body is adequately open and relaxed, then is the perfect time to switch to energy. When this cocktail is properly dosed, the results are really impressive. Of course, this is only my experience, my views; other approaches are equally valid. In shiatsu, like in martial arts, there are many competing styles and you quickly end up in stupid and useless turf wars. For my part, I couldn’t say that one style is better than another. On the other hand, each one has its strengths and weaknesses. My years of practice and my entire reflection revolve around the union of all the strengths I can find. 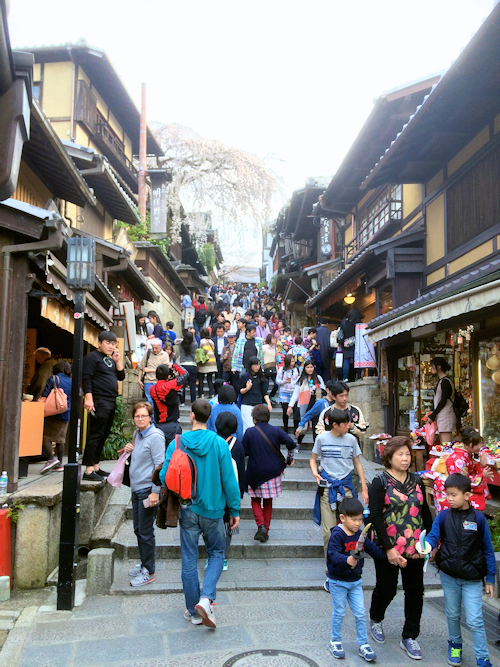 Eternal traveler, here in a street in Kyoto. The triangle formed by your study, your practice and your teaching is very complete. What do you now dream about for the future? I intend to continue my research on the energy side. Throughout my 30 years of martial practices, I’ve heard a lot of stories about this. And it was my curiosity in the matter that brought me to shiatsu, where aïkido clearly failed to explain what Ki was. The problem is that beyond the blabla, there’s not much to be done. Now that I’m beginning to discover a level of energy perception matching my expectations, especially through meditation, Taichi and Qi Gong, I want to see where that can lead me. And of course, I would like to continue to make my students aware of the importance of meditation in the development of energy power. Without work on oneself and without a genuine ability to listen, it is impossible to access this dimension that is both subtler and yet more powerful than anything you can imagine. I would also like to dig on the historical side, because I am an amateur historian and quite a connoisseur of Japan and China. I had the chance to study Chinese for five years during my studies at the INALCO (National Institute for Eastern Languages and Cultures) in Paris. It helps me a lot. While the history of traditional Chinese medicine (TCM) is relatively well known, it is much less the case of traditional Japanese medicine (TJM). Finally, I notice that today’s history of shiatsu is still to be written. What little information I’ve been patiently harvesting shows that a lot of nonsense is being said about this. Such as the fact that Masunaga was Namikoshi’s first student: I’ve heard that a lot during training seminars. In reality, Namikoshi’s school was open in 1940 and Masunga didn’t enter it before 49. Is the school therefore supposed to have remained empty for 9 years? That type of things can be checked and I can’t understand why the Japanese haven’t gotten down to it. It is indeed a nice program. How do you find the strength to do all this? It is not always obvious, especially with quite a busy family life. But in general, I would not speak of strength or motivation, rather of pleasure. Every time I practice shiatsu on someone, I feel an intense pleasure combined with the intimate conviction that it is exactly my place. This sensation has not left me since I was initiated when I discovered shiatsu. This pleasure is sometimes so strong that when coming out of a session I can feel fitter than before it and with indestructibly high spirits. This is something I often explain to students: the real payment in Shiatsu is the smile of the customer and the well-being we receive from the Sky. 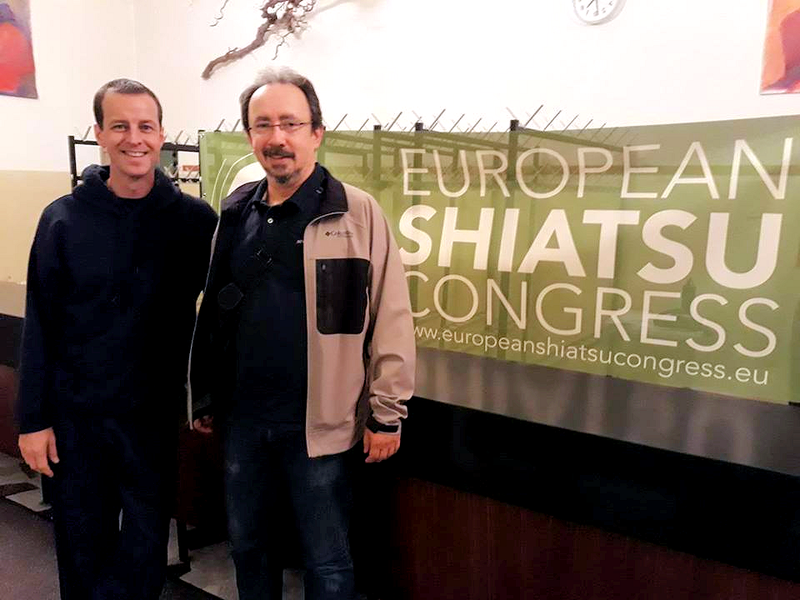 Together with his friend Philippe Banaï, at the European Congress of shiatsu, Vienna 2017. You also learned Qineizang, this belly massage from China. How do you use it? Yes, and you know it full well since we started studying qineizang (ed. : also written chineitsang) together. This massage is just amazing! I read an interview with Stephan Vivien who said that face reading had become a second nature to him. For my part, it’s the belly. Qineizang brought me a more thorough knowledge of the stomach than what shiatsu offered me. I thus base a large portion of the Eastern diagnosis on the Hara’s palpation, which is actually an ancient art in Japan and China. I don’t mix both techniques in one session but I easily switch to the other one in the follow-up care of a person if I judge that it can be helpful or speed up the process of energy recuperation for a person. Usually people love it. I have gotten hold of this huge book in English, which is called “Reflections of the Sea: Hara diagnosis”. It will take me years to assimilate it, but I intend to push the study as far as possible in this area. Many shiatsu schools have a kind of taboo whereby you never start a session with the belly. I don’t know where this belief came out from, but I think it is untold nonsense. After having done thousands of belly palpations, I have never come across any problems with that. In addition, Kawada, Ohashi and other Japanese I met told me to always start and finish a session with the belly. So I follow their competent advice. The Hara is the center of the body, energy, balance, digestion, and it contains most organs. Starting there, you get all the relevant information to help a person. In shiatsu there is this Ki notion (or Qi in Chinese), which flows in the meridians — a notion that is found in martial arts by the way. But many discussions and many doubts exist in this regard. What do you think? The debate ends the day you really encounter energy and then there is no more place for doubts. It happened to me on my 6th or 7th year of study. One evening, in class, the energy of the person I touched came rushing into my hands, then into my arms and finally into my body. It was such an amazing sensation that my eyes teared up. And of course, after that, as soon as I went looking for this sensation, nothing came. It took a few years to make this process easier. It mostly required that I let go of the sheer idea of wanting to find it. A zen meditation session, a practice discovered through Japanese martial arts. There are many ways of addressing the questions about energy and Chinese medicine talks of several sources of production and several forms of energy. It is this misunderstanding (or ignorance) that spurs a debate. But it is clear to me: everything is energy, since matter is basically formed of atoms and waves. I’d love to have someone tell me otherwise. While you can’t see these atoms and waves with the naked eye, you can feel the energy released by their infinitesimal movements. Once you yield in to letting yourself go to this dimension, it comes very easily. Then you can give it a direction or another, with or without intent, but it’s another story. As for Martial Arts, if questions about this remain, it is simply because this study does not fit into the technical and sportive context in which the martial disciplines have been confined. Without training, no understanding. A direct question now: is Shiatsu a medicine per se? I see what you mean. A medicine per se, no I don’t think so because it misses the notion of using plants or molecules specific to Western medicine. Besides, we can’t do everything with shiatsu. Then again, what kind of medicine achieves everything these days? On the other hand, it is a complementary approach, no doubt. In Japan, shiatsu has been a full-fledged medicine since the 1960s, recognized and approved by the Ministry of Health. Why not so back home? The same goes in China with this other version of the Tuina. In the US, Canada, Switzerland, Germany, Shiatsu is a complementary medicine. In France, the profession of shiatsu practitioner has been recognized since 2015. Are these countries dumber than we are in Belgium? Or have we missed something these countries understood? In the West, it is generally necessary to prove everything from a scientific point of view. For me, the only useful proof lies in the results and that, by the way, is what most scientific studies on Shiatsu focus on. Considering that there have never been any accidents with Shiatsu, I wonder what makes the authorities so edgy… Furthermore, in all countries where Shiatsu is integrated, not only are doctors and nurses pleased with it but patients are quite happy to have one more tool offered to them in their therapeutic arsenal. And in no way did that slow down medical consultations, so that there never were any losses, only greater satisfaction for all. Shiatsu practitioners are sometimes blamed for their lack of training, but as soon as recognition comes, authorities put this in good order. Japan’s, Canada’s, Germany’s or Switzerland’s example could serve as a basis and add to that State approved curricula and the matter will be solved. So, yes, Shiatsu is a complementary therapy. The following observation can help understand this complementarity in a concrete and scientific wording: surgery cuts in deep and then patches you up. It operates at the material level. Allopathic medicine uses molecules. It operates at the chemistry level, which is already somewhat subtler. Nuclear medicine uses radiations, especially in the case of cancer, but also in order to do an X-ray. So it operates at the atomic level. Psychology and hypnosis rely on thoughts and memories, but also on mental mechanisms (consciousness, unconsciousness, etc.) So they operate at the level of the electrical exchanges inside the brain, which is even subtler, right? MRI, these formidable tools to look inside the body, use sound waves. We could therefore talk about sound medicine, which, incidentally, undergoes changes at full throttle right now. Shiatsu, like acupuncture, uses the energy released by the body, thus through the movement of atoms, but not only. So we could talk about energy medicine in this case. Why wouldn’t it find its place next to the others? Thank you for having shed some light onto these questions and let us wish you a continued success in your passion for shiatsu. [ii] Aïkido and Iaïdo’s teacher, also a student at Kuroda Senseï’s school in Japan, Jean-Marc Dessapt teaches those martial arts in Toulouse. [iii] Yuichi Kawada is based in Brussels and teaches his own style, Yoseido Shiatsu. [iv] Shigeru Onada is the spokesperson of Namikoshi Shiatsu in Europe. Based in Madrid, he also founded his own style, Aze Shiatsu. [v] Watary Ohasi created Ohashiastsu, a technique that is evolving into the “Ohashi method” because it incorporates many inputs in its shiatsu. He teaches around the world and is based in New York. [vi] Jean-Marc Weil also is a shiatsu teacher in France, Guyana and Belgium. [vii] Raphaël Piotto is an acupuncture practitioner and a teacher of Chinese medicine. He loves using Chinese energetics with his bare fingers. [viii] Bernard Bouheret is the author of many books including the famous “Shiatsu Vade Mecum – 108 prescriptions for therapeutic shiatsu”, and the founder of his own style , Sei Shiatsu. 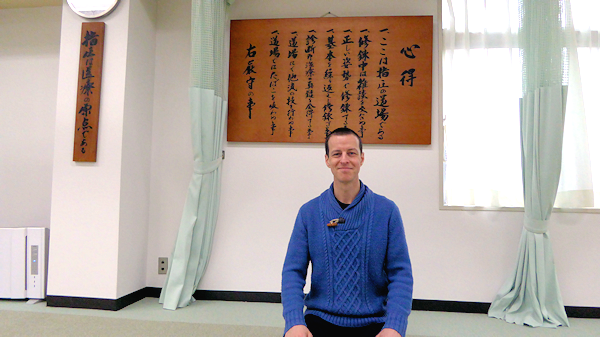 He teaches in Paris at the EST (Therapeutic Shiatsu School). He also is a fine Qi Gong connoisseur. [ix] Frans Copers was a Shiatsu pioneer in Belgium, the president of the Belgium Federation for 20 years, then the president of the European Shiatsu Federation. He has now become the heir of master Akinobu Kishi’s Seiki Soho that he proficiently teaches. [x] More precisely, Ivan was received by Kazutami Namikasi, Yuji Namikoshi, Akitomo Kobayashi (senior instructor) et Kazuo Watanabe (teacher and responsible for scientific research). [xi] Yasuhiro Irie is a master of Kokodo Jiujitsu and Koho Shiatsu.